Monday’s numbers: Rachel Maddow-Hannity-Tucker 1-2-3. 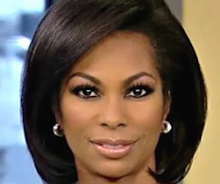 Q&A: Harris Faulkner on politics, news, and not taking sides. Cillizza WH turnover story?has seven errors. ?Weekend numbers. Judge Jeanine makes book. Peter Rice talks New Fox, Disney, etc. Updated 5:00 pm? ?Use our valuable bandwidth to post your?cable news comments?in today’s open thread.